The detection of glucose is important in many industries and applications, from the monitoring of glucose for diabetics, to knowing the sugar in a soft drink, to measuring glucose in a bioreactor or cell culture. 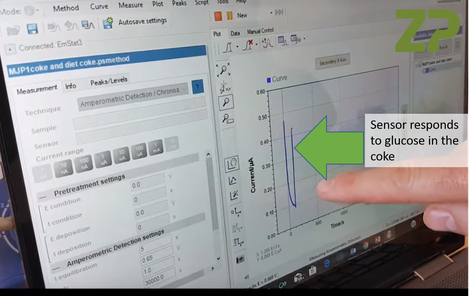 With a glucose sensor one can perform quantitative and qualitative experiments. A quantitative experiment is where we measure and report the amount of glucose in a drop of blood for example, see adjacent figure. 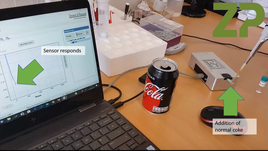 The application experiment described within this document is a qualitative experiment, which requires no chemicals and can demonstrate a clear response by the sensor to regular coke relative to coke zero which has no sugar. The output from the experiment is qualitative in that the output of the experiment is ‘YES or NO, glucose is present’. 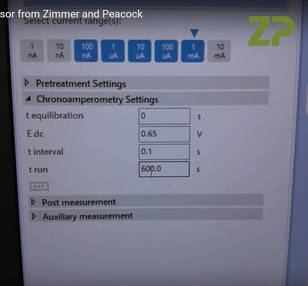 In this application we take a Zimmer and Peacock glucose sensor and use it in conjunction with an AnaPot potentiostat, though the potentiostats from PalmSens also work in this application. We will demonstrate the change in signal for ZP glucose sensor as we go from coke zero to normal coke. A ZP glucose sensor is a Type One Glucose Sensor. A Type One Glucose Sensor typically utilizes glucose oxidase (GOx) as the sensing enzyme and oxygen naturally present in the solution as the mediator. The GOx enzyme catalyses the reaction between oxygen and glucose. with glucose initially converted to glucolactone, whilst the oxygen is converted to hydrogen peroxide. The hydrogen peroxide can diffuse to the working electrode where it is oxidized back to oxygen and two electrons are released to the electrode, these electronics are seen as a current by the potentiostat, see adjacent figure. 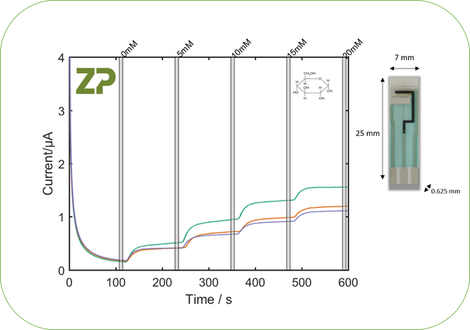 The glucose oxidase in the ZP glucose sensors is immobilized, this means that the enzyme is held within a polymer and is not free to diffuse away from the sensor. This immobilized enzyme is a benefit as the sensors can be run in continuous monitoring operation where the sensors are within the sample and continuously measure the glucose signal. 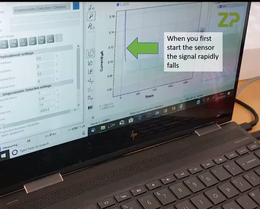 The ZP sensor shares some similarities to those of Dexcom and Medtronic which are also Type One Glucose Sensors with an immobilized enzyme formulation. The ZP glucose sensor can be contrasted with all/most self-monitoring-blood glucose strips (SMBG), where the enzyme formulation is soluble and dissolves into the sample. These SMBG sensors are therefore a onetime use and not suitable for continuous monitoring. To see a video demonstration of the application described within this document please see this video. 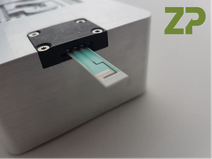 The hardware we use in the application note is the AnaPot and the ZP Glucose sensor. To perform this experiment please follow these steps. STEP ONE – Please place the ZP glucose sensor in the front of the AnaPot, or PalmSens, as shown in the adjacent Figure. STEP TWO - The software is set up in accordance with the adjacent figure. STEP THREE - Adding sample - In the first instance add the coke zero as shown below, see adjacent figure. STEP FOUR - Start the potentiostat - Please start the potentiostat by clicking the button in the software, see adjacent figure. When the potentiostat is first started and coke zero is on the sensor the signal will look like that in the adjacent Figure. STEP FIVE - Adding a drop of normal coke - After about 200 seconds add 10 microlitres of normal coke to the 100 microlitre drop of coke zero which is already upon the sensor, see the adjacent figure. 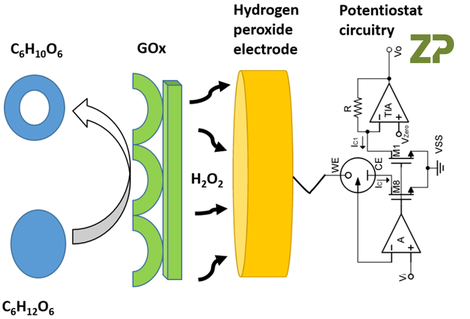 Very quickly the magnitude of the signal increases, as shown in the adjacent figure, this is due to the biochemical reaction and the subsequent oxidation of the hydrogen peroxide on the working electrode of the glucose biosensor. • STEP ONE - Rinse the end of the sensors that was in contact with the coke with water, this can be tap water but ideally we use deionized water. • STEP TWO – Gently draw the water of the sensor using a tissue, we are just trying to gently dry the sensor before we store the sensor. • STEP THREE – Please store the sensor in a cool dark place a fridge at approximately 5 degC. Please note that we recommend these conditions to extend the life of the sensor, but you can leave the sensor out in the air at room temperature, but to get the longest life from the sensors then please use the recommended storage conditions.